At it’s surface, Valentine’s Day seems like it’s all about the love. But, when you really think about it, it’s all about the sugar! Chocolates in a heart-shaped box in the break room at work, a sample or two (or in my case, five) while you help the kids assemble their class treats, and a decadent dessert with your love all add up to a major sugar-fest. I even snag a few pieces of candy from the kids’ Valentine’s Day stash once they get home from school. Depending on how big their haul is, I end up snacking on sweets all week. I can’t control what the kids get in their Valentine’s Day box at school, but I can at least stop contributing to the sugar-palooza in the classroom by whipping up a sugar-free alternative (or two). 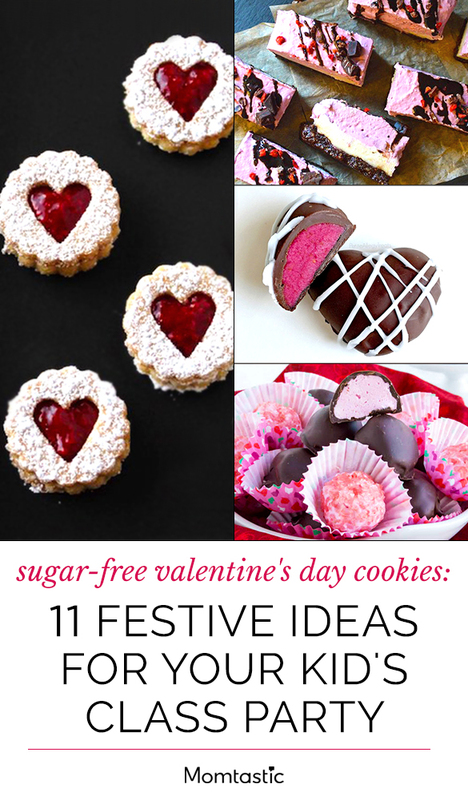 I’ve been on the prowl for a few good recipes, and I’ve rounded up 11 Sugar-Free Valentine’s Cookies and Treats that the kids can bring to school. Love these ideas? Be sure to share this on Pinterest!